Slot Machines or slots are a hugely popular gambling option found both online and in brick & mortar casinos. There are many different types and hundreds of variations of slots so it's a good idea to try a few out before settling on a specific game. The age old game of slots, even online, is as straight forward as casino games get. Most slots simply require you to deposit credits from your account into the virtual machine, select your desired denomination and number of coins, optionally choose the number of paylines you will play, and then hit the "SPIN" button. The online slot machine will do the rest! 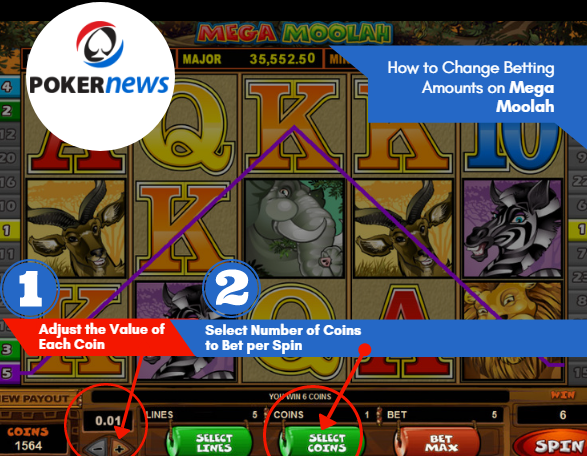 Payouts vary depending on the number of coins chosen, but often there is a jackpot bonus as the top payout if you play the maximum number of coins. So if this is the case then it's a good idea to play the maximum coins and reduce the denomination to a level you are comfortable with. The original slots have three spinning reels with 22 different symbols on each reel. Each time a spin is made, the three reels come to rest randomly with a selection of symbols showing in the game window. Certain combinations of symbols in the game window result in payoffs according to the payout table displayed at the top of each slot machine. Video slots represent the more modern form of slots and typically have 5 reels as opposed to the 3 reels in Classic Slots. Video Slots also offer the opportunity to bet on multiple pay lines, giving you multiple ways to win!Options and themes vary between each slot machine, but typically you can bet between 1 and 25 pay lines. Video Slots will often have a unique Bonus Feature that is specific to the variation of Video Slot Machine you are playing. There are many different features but typically they will give you an opportunity to win Free Spins when a certain combination of symbols appear on the reels. Free Spins allow the game to be played automatically for a fixed number of spins without costing you any money. Features are a great opportunity to win some bonus money without any risk! Check the payout table on the slot machine you are playing for full details of its Bonus Feature. Upon visiting an online casino you will also see many Progressive Slot Machines. Rather than having a fixed payout, these slots will pay the top payout as a jackpot bonus. The Jackpot values start at a specific level and grow each time somebody on the network makes a bet on one of the Progressive Slot Machines. The more you play the bigger the jackpot gets until someone wins it all! Slots are a fun way to gamble away an afternoon with the potential chance of a huge jackpot win if you are lucky enough! Slot Strategy: Is There a Way to Beat the House? Before diving into any tips or strategies, as a slot fan you should familiarize yourself with how slots work. Slots are run by something called a Random Number Generator (RNG), a programming system that ensures that all spins are yield randomly generated results. it means that every bet you make will result in a randomly selected combination of symbols across the reels. Sometimes the spins yield winning combos, others do not. However, there is a way to tell if a certain machine pays out more money or more often. These two terms are what you should look out for as a slot player both only and on slot machines on your favorite casino's floor. Together they will tell you just how high the house edge is! Hit frequency is expressed as a percentage and will tell you how many of your spins are likely to yield a winning combination. This doesn't factor in the value of the wins, but rather the average number of hits the pay out. Return to player rate, however, shows on average how much money is returned compared to what was put in. Most slots have RTPs in the range of 90-97%, and the higher this percentage is the higher the chances are that you can collect some big wins! While you can't influence where certain symbols will appear, you do have the power to choose games with odds that are more in favor than others. Choose a slot game that has a decent hit frequency and higher than average RTP, and while this seems simple enough the struggle you will have is finding a game that has the best of both worlds. Usually high RTPs mean lower hit frequencies and bigger wins, while high hit frequency means more wins but smaller payouts. If you enjoy small and consistent wins with modest bets then hit frequency is what you need to look out for. If you're after those massive progressive jackpots and life changing millions they promise, a game with higher RTP would suit your betting style better. More Winning Slot Tips to Try! Not only can you choose your game in the hopes of boosting your odds, but you can also select how much you want to bet for every spin. This may not seem like a big deal but how much you bet and how many bets you place can affect your ability win for the better or for the worse. The key to winning slots is consistency and pace. Don't bet too high or you'll risk losing everything too quickly, and don't bet too low or you won't get any worthwhile payouts. Measure your bankroll and aim to play for at least 30 minutes or so. Calculate how much that would cost in the case that you would lose everything, but of course with the right choice of game it is a highly unlikely scenario! Over time, the house always wins. That is especially true for slots, and while the RNG ensures that on average all players lose, you may be lucky enough to jump in during a winning streak. That is why you should aim for at least half an hour of game play, but no longer than an hour or two on the same machine or game. 20 FREE Spins - No Deposit Needed! Collect up to €1,000 in welcome bonus and play Starburst with 200 free spins!